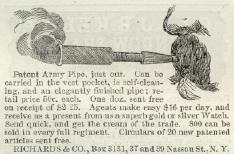 You are viewing our online collection of Harper's Weekly newspapers published during the Civil War. These newspapers served as the primary source of information for people during the Civil War era. These rare documents are used today by researchers and historians. OLD GENTLEMAN FROM THE COUNTRY. 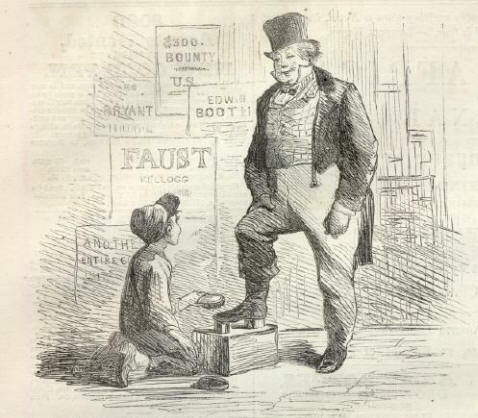 "And so you've bin to the Great Fair? And what did you see there that you liked most ?" SHOSHOE-BLACK (promptly). " The Big Shoe, with the Little Woman in it !" The only enameled Turn-over" Collar made in metals. Send $1 for a "Turn-over" or 75 cents for a "Choker," to C. H. WELLING, 94 Pine Street, N. Y., and receive it by return mail. For Indigestion, Heartburn, &c., manufactured only by S. G. WELLING, and sold by druggists generally. 50 cent, per box. Depot No. 207 Centre St., New York, second floor. Sent free by mail for 65 cents. IMPORTERS OF FINE CHINA, WEDGEWOOD, PARIAN, &c., &c. ENGRAVED Gross to order in great variety. COLORED STONE CHINA DINING SETS. Jet. Coral, and Steel Goods. TELLS WHAT TO DO, AND HOW TO DO IT. Both sent free by mail for 25 cents. A Beautiful Complexion, free from Tan, Pimples and Freckles, may easily be procured by using the "BALM OF THOUSAND FLOWERS." For shaving it is unsurpassed. It is composed of palm oil, honey, and other valuable articles, highly perfumed by its own ingredients, and when used for washing, night and morning, renders the skin soft and white, and free from blemish. Price 50 cents. 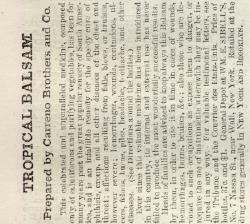 The Trade supplied by HOWARD, SANGER & CO., 105 and 107 Chambers Street, N. Y., and for sale by all Druggists. Shults' Onguent, warranted to produce a full set of Whiskers in six weeks, or money refunded. Sent post-paid, for 50 cent,. Address C. F SHULTS, Troy, N. Y. TO CONSUMPTIVES.—You will get the Recipe for a sure cure for Coughs, Colds, Consumption, and all lung complaints, by sending to Dr. Uncas Brant, Box 3531, New York. He sends it free. Write for it.—It has cured thousands. $15 Per Day $20 And a Gold Hunting-Case Watch given free to all agents who sell our Original and " only Genuine” Extra Large Size Stationery Prize Packages. We are the only manufacturers of the " Celebrated American Prize Packages," and none are genuine unless bought direct from us. We present free to every one who acts as our agent a Fine Gold or Silver Hunting Case Lever Watch, "Genuine English Movements." These watches are sent with the goods. One of our Wonderfvl Packages contains more really valuable articles than any half dozen others ever sold. 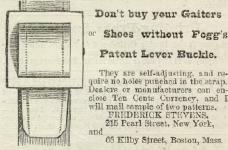 Among the surprising contents of " each pack-age" will be found large quantities of " Fine Stationery," Pens, Pencils, Envelopes, "Engravings," Ladies' Fashion Plates, Designs for Needle-work, Cottage Keepsakes, Household Companions, Letter-Writer's Instructor. Parlor Amusements, Gent's Pocket Calendars for 1864, Union Emblems, Games, Rare Recipes, Many ways to get rich, Yankee Notions, Fancy Articles, Rich and Costly Presents of Fashionable Jewelry, &c., &c., all together worth many dollars, for only 25c. Agents make immense profits. One hundred packages, with presents of jewelry and gift of a superb watch, show - bills, and sole right for a town or county, sent anywhere on receipt of $15. Smart agents can sell 100 Packages in a few hours. This is the greatest money-making business of the age. Agents wanted in every town. Send for our Great New Circular for 1864, containing Extra Premium Inducements, free. Address the Great AMERICAN PRIZE PACKAGE CO., Cor. Nassau and Ann St., New York. Only Original, and Largest and Oldest Prize Package House in the World. $50 AMERICAN $50 LEVER WATCHES. TRADE MARK, P. S. BARTLETT, WALTHAM, MASS., FULL JEWELED, WARRANTED, IN 4 oz. COIN SILVER HUNTING CASE, GOLD JOINTS, FANCY PUSH PIN, FOR $50. Also every variety of good Watches at equally low rates. All orders front the Army must be pre-paid, as the Express Companies will not take bills for collection on soldiers. J. L. FERGUSON, Importer of Watches. 208 Broadway New York. Good News for the Army. Hereafter we will send, post-paid, any of our PHOTOGRAPHIC ALBUMS ordered by soldiers for themselves or friends, giving an Album of the full value of the money sent. Our Albums have the reputation of being superior to all others in beauty and durability, and range in price from 50 cts. to $50. now embraces about 5000 officers, army and navy, statesmen, actors, copies of works of art, &c. Catalogue sent on receipt of stamp. Our assortment of these is very extensive, including a great variety of views of the present war. Catalogue sent on receipt of stamp. Pocket Photograph Albums for 16 pictures, morocco gilt, sent, post-paid, for $1. A. F. GARDNER, Greenfield, Mass. Holloway's Ointment and Pills.—There is a traitor in the camp; they have been counterfeited! But a sure test of genuineness exists in the water-mark, "Holloway, New York and London," which is discernible as a water-mark in every leaf of the book of directions accompanying each pot or box. Sold at the manufactory, No. 80 Maiden Lane, New York, and by all Druggists, at 35c., 88c., and $1 40 per pot or box. And Stuttering cured by Bates's Patent Scientific Appliances. For (New Edition of) descriptive Pamphlets and Drawings, address H. C. L. MEARS, 277 W. 23d St., N. Y.
WASHINGTON, March 28, 1864. GENTLEMEN:---You may use the sentence about "Cudjo's Cave" which I wrote to Mr. Trowbridge. The book MERITS HIGHER PRAISE, and I have heard it more highly praised by discerning judges. Yours very truly, S. P. CHASE. Messrs. J. E. TILTON & CO., Publishers, Boston. "The inflamed condition of my right eye has prevented my reading or writing much lately. "Cudjo's Cave" I could not help reading, however. It interested and impressed me profoundly." Importers, 136 and 138 Cedar Street, New York. Established Seventeen Years! Chemicals, Soda-Ash. The following brands: Johnson's, Kurtz, J. Hutchinson & Co.'s., Garrett''s. Marsh's, for Soap, Glass, or Wooden Mills, constantly on hand, various tests. For sale by THOS. ANDREWS & CO., Importers, 136 and 138 Cedar Street, New York. A BEAUTIFUL. ENGRAVED GOLD PLATED WATCH, Double Case, Lever Cap, small size, enameled dial, cut hands, "English Moevements," and correct time-keeper. A single one sent free by mail in neat case, for only $7. A neat SILVER WATCH, same as above, specially adapted to the ARMY. Sent free by mail, for only $7. $15 European Timekeeper. $15 0R, COMPASS WATCH. A SUPERB " Extra Double Gold Plated" engraved or engine turned Hunting Case Watch, Magic Spring, "Genuine English. Jeweled or Nickel Movements," "M. J. TOBIAS"" Independent Action, Self Balance, and has a NEAT MINIATURE COMPASS sunk in the cap and attached to the movements, making it " Correct Guide"" to the Soldier or. Traveler. Perfect time-keeper, "warranted one year." WILL STAND ACID, and is an Exact Imitation of $100 Watch, Used by the British Army Officers. Sent free by mail, in elegant Morocco Case, for only $15. Frank Leslie's Illustrated Newspaper of Feb. 20 says of the "European Timekeeper," " It is a novelty here, and an imitation of the celebrated timekeeper so much in use among the British army officers, and is calculated to meet the wants of our soldiers in the field." Illustrated News says, " Correct timepieces ; and for beauty and fine finish they are equal in appearance to $100 watches." Address CHAS. P. NORTON & CO., Importers, 38 & 40 Ann Street. New York. Ready made or to measure, at $33, $39, and $45 per doz. Self Measurement for Shirts. Printed directions for Self-Measurement, list of prices, and drawings of different styles of Shirts and Collars sent free everywhere. FRENCH FLANNEL OVERSHIRTS, $3 00, $3 75, and $4 50 each ; all cut one yard long. A single shirt sent by mail on receipt of the cash and 63 cents postage for each shirt. To Military Men and Travellers they are invaluable. Price 75 cts. each ; sent by post to any part of the Union on the receipt of 90 cents. Magnifying small objects 500 times. MAILED FREE everywhere for 35 CENTS, OR FOUR FOR $100. States, up to the present time. Complete in one large volume of 200 pages, with a portrait of President Lincoln. Price Fifty Cents in paper, or Seventy-five Cents in cloth. General McClellan's Life and Reports. THE LIFE, CAMPAIGNS, BATTLES, REPORTS, AND PUBLIC SERVICES OF MAJOR-GEN. GEORGE B. McCLELLAN, the HERO of WESTERN VIRGINIA, SOUTH MOUNTAIN, and ANTIETAM, with a full history of all his CAMPAIGNS and BATTLES, as well as his REPORTS AND CORRESPONDENCE WITH THE WAR DEPARTMENT AND THE PRESIDENT in relation to them, from the time he first took the field in this war until he was finally relieved from command after the Battle of Antietam; with his various SPEECHES TO SOOLDIERS, etc., up to the present time. New and Enlarged Edition. Complete in one large volume of 200 pages, with a Portrait of General McClellan. Price Fifty Cents in Paper, or Seventy-five Cents in Cloth. Copies sent everywhere, free of postage, on receipt of price. Agents wanted everywhere to sell the above books, who will be supplied with them assorted, to suit themselves, as follows:—The Fifty Cent editions at $ 3 a dozen, or $25 a hundred; or with the Cloth editions at Six Dollars a dozen, or Forty-five Dollars a hundred. Send on your orders, with cash enclosed, at once, for whatever quantity you may wish, at these rates, addressed to T. B. PETERSON & BOTHERS, 306 Chestnut Street, Philadelphia, And they will be sent to you within one hour after receipt of the order.